I can say that they were quite silly and would have sent @seanset reaching for a pint or two. But something funny happened on the way to that post. It hit me that here was his daughter, 19 years old, enjoying Twitter with her father. I wasn’t speaking to my father when I was that age, and haven’t since. And I thought of all of his tweets about his three daughters, the love he’s displayed for them, and the photos he’s shared. The miles he and his wife have logged taking care of them. And I couldn’t do it. I have too much respect for this man who lives an ocean away. One day, I’m going to walk into a pub in England, place a few pounds on the bar and buy him and my other English friend @onlyz the drinks of their choosing. I might even watch some cricket with them. Okay, maybe the cricket part is a stretch. I’ll watch soccer. You don’t need a 500-page rule book to understand it. I also know that his daughter’s real tweets will get him in the long run anyway. That’s what daughters do. I just have to be patient and pick my moments. I will share one fake tweet from his daughter. It’s the one that would shock him the most. 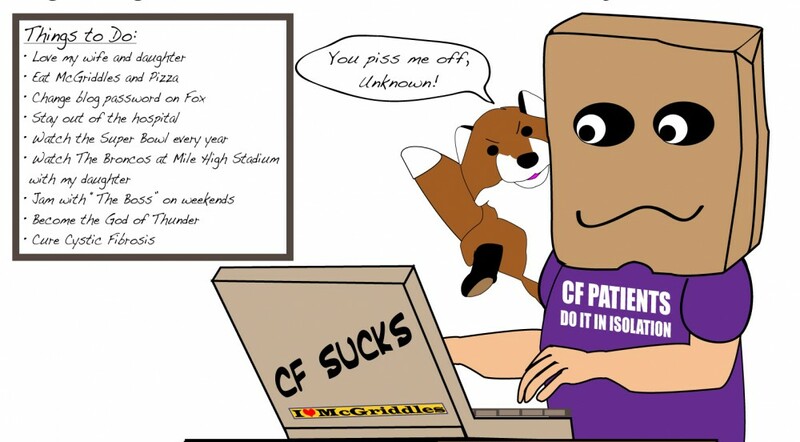 This entry was posted in cystic fibrosis, Fun & Humor and tagged cystic fibrosis, Fun by unknowncystic. Bookmark the permalink. I look forward to that day, plenty of proper English ale(not warm!) and a big bag of pork scratchings. We will visit Upton Park and watch the Mighty Hammers win the premiership. Don’t worry about the cricket I’ll explain as we go along. Sounds great. I remember how you tried to explain cricket before. Didn’t work. BTW, I played the Red Dwarf clip for my daughter. Opps, bad language. Very funny but I guess the clips I’ve watched up to this point haven’t been cheeky. I need to fix my itunes.